AUREA, (Eighth Century), a young girl from Amiens in Picardy, who received monastic tonsure at Boves in Piedmont (about 80 km / 50 mi south of Turin). St. Aurea later served as Abbess of a large monastery in Rouen, Normandy. No further details of her life are extant. CEOLLACH, a native of Ireland, St. Ceollach briefly served as Bishop of the Mercians or Mid-Angles. He retired to Iona, though he returned to his native land to repose. The exact dates of his life are uncertain, but it is believed he lived during the seventh century. 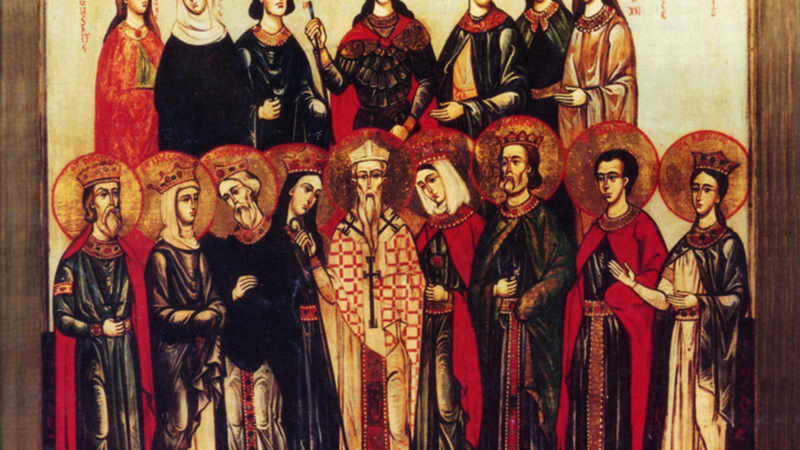 EPIPHANIA, according to the local traditions of Pavia dating from the late Middle Ages, St. Epiphania was a daughter of Ratchis, King of the Lombards and of Italy; and may very well have been a nun as well. She reposed circa 800. FAITH (FOY), (Late Third–Early Fourth Century), often confused with the three legendary sisters known as Faith, Hope, and Charity (1st August), this St. Faith was a young maiden from Agen in Aquitaine, known for her extreme beauty and even greater holiness of life. St. Faith was tortured to death with a red-hot brazier, under Maximian Herculeus, for refusing to make pagan sacrifices. Her shrine at the Abbey in Conques was a popular stop for pilgrims on their way to Santiago de Compostela. MAGNUS, a Bishop of Oderzo on the Adriatic, who is best remembered for founding some of the earliest churches in Venice. St. Magnis reposed circa 670 and is buried in the church of San Geremia in Venice. MARTYRS of TRIER, (Third Century), the largest group numbered amongst those martyred in Trier by order of the Prefect Rictiovarus during the reign of Emperor Diocletian (r. 284–305). PARDULF (PARDOUX), a native of Sardent near Guéret in Gaul, who received monastic tonsure the monastery of Guéret, of which he later served as Abbot. According to tradition, as Umayyad forces were retreating following the Battle of Tours, and arrived at Guéret, they spared the monastery due to the prayers of St. Pardulf. He reposed circa 738. ROMANUS of AUXERRE, the fourteenth Bishop of Auxerre in Burgundy, he is believed to have reposed circa 550.